The imageRUNNER 5050N model is designed for cost sensitive environments that require a robust and reliable engine design to handle their high volume needs. Powered by Canon's imageCHIP system architecture, the imageRUNNER 5050N model features exceptional multifunctional performance and reliability. The imageRUNNER 5050N model offers a full range of document handling capabilities such as saddle stitch finishing, 2/3-hole punching, and a Document Insertion Unit with the ability to "C" and "Z" fold documents. 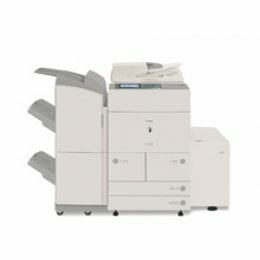 There's standard support for advanced digital copying, network scanning, Mail Box features, and network printing as well as optional support for single-line fax capabilities, and the ability to distribute electronic information across a digital landscape with Universal Send. Operating at up to 50 pages-per-minute, the imageRUNNER 5050N model is equipped with a 40GB Hard Disk Drive and 1GB RAM, providing users with exceptional productivity and reliability. Incorporating Canon's MEAP (Multifunctional Embedded Application Platform) architecture, the imageRUNNER 5050N model applications can be customized to meet unique business needs. The customized applications run from the imageRUNNER 5050N control panel streamlining document workflows. The color user interface panel and intuitively -designed device drivers provide user - friendly operation for both walk-up and desktop environments. Supports a host of Internet-enabled capabilities to offer the tightest possible integration across entire corporate networks. The Mail Box functions of the imageRUNNER 5050N model serves as a centralized system for information-sharing, on-site document storage and print-on-demand applications. Users can take advantage of standard network prinitng with support for PCL 5e/6 and Canon's UFR II (Ultra Fast Rendering) technology. The optional PS Printer Kit-R1 can be added providing support for PostScript 3 emulation. For those users with higher bandwidth requirements, the imagePASS-S2 features its own hardware dedicated to printing applications, and supports genuine Adobe PostScript 3 and PCL 5e/6. The imageRUNNER 5050N model can be equipped with an optional single-line Super G3 fax board for the ability to transmit faxes at impressive speeds. With its optional Universal Send technology, the imageRUNNER 5050N model allows users to scan directly into the device for distribution to multiple destinations. Advanced Send modes such as Searchable PDF (OCR), Encrypted PDF and Digital Signature PDF modes can be added for an even more sophisticated solution. With Remote UI, features and functions of the imageRUNNER 5050N model are controlled and accessed right from a user's desktop.